Applied measuring method relates to the measurement of the change of natural terrestrial magnetic field, induced by an interference field of ferrous objects. We utilize two magnetometers as measuring instruments - Datalogger Systems - Ferex 2000 XL and Ferex 4.032 from Foerster / Reutlingen / BRD company, and measuring system DLM - 98 / 3 Kanal from Sensys / BRD company. Potentially contaminated area will be classified into partial areas in the process. Each area will be surveyed in parallel traces with magnetometer; data stream will be digitized, stored and displayed by special software from companies Foerster and Sensys in the form of colour-coded charts. By recognizing the magnetic field anomalies we get data about quantity, volume, location and depth of bodies responsible for distortion of magnetic field. Ferromagnetic obstruction on the surface will be removed according to possibilities before surveying. If this is not instantly possible, then notice of their precise position is specified and noted in code chart. However, adverse effects of measurement results may appear thereby. 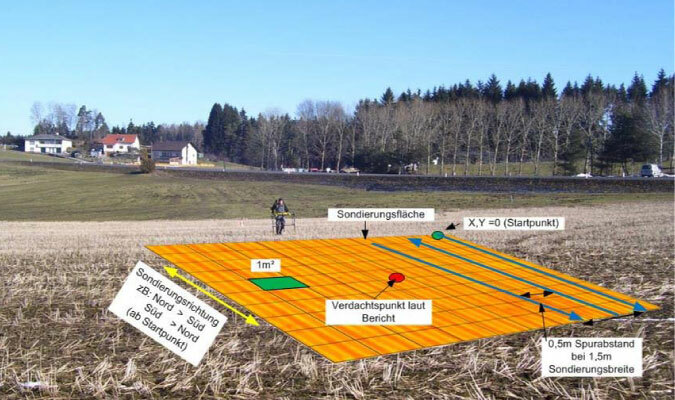 The area will be either by high heat stroke contingent excluded from survey, or it will be searched out with the help of ground-penetrating radar measuring including shielded antenna.